Wayne Scott Panelbeating and Spraypainters have been helping customers to get their vehicles safely back on the road for almost 25 years. We pride ourselves on achieving the very highest level of workmanship, with efficient and friendly service. We are constantly improving, innovating, and expanding our business. This has been recognised and rewarded at the 2018 CRA Annual Conference Prizegiving, where we received two premier awards. There's nothing worse than being left without your vehicle, so at Wayne Scott Panelbeaters & Spraypainters we control a fleet of 25 loan cars. This allows our customers to go about their normal day-to-day activities. To check availability please give us a call on 09 826 3316. Wayne Scott's panelbeating story began with an apprencticeship under his uncle in the late 1980's. In 1995 Wayne went out on his own, starting a mobile panelbeating business with a single van. Today his award-winning operation is spread across five New Lynn premises. There are 3 Gold Repairers in West Auckland. And we're one of them. Wayne Scott Panelbeating & Spraypainters are authorised Gold Repairers for IAG, AMI, NZI and State Insurance. have the authority to start the work immediately. Wayne Scott Panelbeating and Spraypainting are proud to be members of the CRA. For our customers it means that no extra cost, the Collision Repair Association (CRA) guarantee our obligation to provide quality workmanship, parts and materials in your repair. For more information about this guarantee, please visit the CRA website at www.collisionrepair.co.nz. MTA is the largest body of automotive dealers, repairers, retailers and service stations within New Zealand. 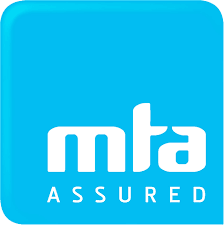 Under the MTA Code of Ethics and Customer Promise, we promise to deliver the highest quality of work and service.
" I have found the staff at Wayne Scott Panelbeaters to be very courteous, helpful and prompt. I will not hesitate to use them in the future and to refer any of my friends to them. "